Sports Illustrated Kids. New York, NY: Time Inc., August 2010. Print. Sports Illustrated Kids. New York, NY: Time Inc., June 2010. Print. Sports Illustrated Kids. New York, NY: Time Inc., April 2010. Print. Sports Illustrated Kids. New York, NY: Time Inc., March 2010. Print. 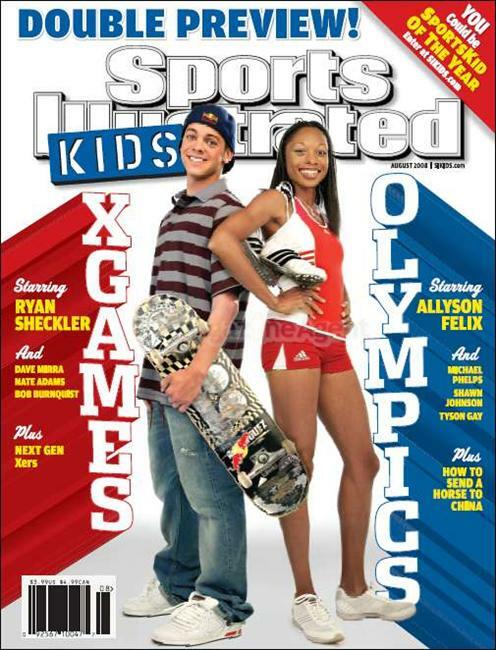 Sports Illustrated Kids. New York, NY: Time Inc., January/February 2010. Print. Like it's namesake, Sports Illustrated Kids features timely information on popular sports and sporting events in the US, glossy action shots, and athlete profiles. It also includes plenty of jokes, games, reader submissions, and contests - as well as profiles on tween and teen athletes - giving it just the right mix of "older kid" and "younger teen" to appeal to tweens. Everything about Sports Illustrated Kids speaks of quality, from the sophisticated photos to the well researched, in depth articles to the limited use of non-standard fonts. Although most magazines for kids and teens seem to ease into the actual articles, Sports Illustrated Kids dives right in; the first few pages of each issue are usually eye-catching full page photo spreads but most issues have a full blown, several page article by the time one is one a quarter of the way through. While this may seem to run counter to the typical appeal of magazines to reluctant readers - snapshot articles, busy pages, diverse content - what it shows instead is great amount of respect for it's readers and and it's subject. Sports Illustrated Kids is not stuffy or boring. It's certainly not full of articles that belong in the Economist and it has plenty of one line blurbs and paragraph long articles. However, it also lets it's content - both text and photos - speak for themselves and doesn't feel the need to treat every line as if it were a callout. I believe it's a stronger, more appealing magazine for doing so. Sports is not only a popular subject, it's also a topic where enthusiasts place a high value on timely information. Having periodicals on sports will keep kids interested in not only reading, but also in coming back to your classroom or library for new information on their favorite athletes and events. One might think that, like it's namesake, SI Kids would appeal overwhelmingly to boys. While it is true that it is more popular among boys than girls for obvious reasons, making it is an essential magazine to keep around for your reluctant boy readers, it is also much more female friendly than the adult version. For example, both female athletes and athletes in non-traditonal sports get more attention in SI Kids than they do in SI- so don't discount it's appeal to reluctant girl readers as well.